A*STAR has built a testbed for digital twins, the virtual counterparts of real manufacturing equipment. These factory innovations could help companies save huge amounts of time and money by predicting and adjusting for their partner machine's condition on the go. Imagine that a manufacturing giant has a machine on one of its factory floors in which a spindle is about to snap. In a conventional factory, the whirring machine will give no warning of its impending malfunction, and its failure will come at a random moment. Diagnosis and repair will be relatively slow, constrained by data collection and the organizing of human and material resources. For a fast-moving consumer goods (FMCG) company, the lag can be costly. "Because of the high volume, we're talking about millions of dollars in losses for every hour of down time," says Stuart Wong, the senior group manager at the Advanced Remanufacturing and Technology Centre (ARTC) in Singapore, where a number of companies collaborate with A*STAR researchers on advancing manufacturing technology, including making highly intelligent, sensorized machines. With some help from ARTC's model smart factory, a manufacturing technology testbed that opened in August, kinks could be navigated using a concept known as a 'digital twin'. The idea is that machines will be sensorized, so that the spindle in the machine is continually monitored and its performance data sent to a central control room. There, the data is fed into a computer that acts as a digital twin of the machine – a virtual copy that accurately reflects the machine's current operating status based on real-time sensor data and physics modeling. The digital twin, detecting a slight wobble in the spindle, might adjust its physical counterpart's operating parameters to correct for the wobble. Or, if the wobble can't be corrected for, it might warn of an impending malfunction. In the control room an operator would then be tipped off, and this person can then set off a standardized response. "The digital twin might then create a maintenance work order, determine whether you could reroute production so that delivery is not impacted, find the appropriate maintenance personnel, and tell them where to go," says Anikath Murali Das, one of ARTC's program managers. Those maintenance personnel could quickly repair or replace the faulty machine, guided, either by a tablet showing a customized data feed on the impacted machine, or by a set of augmented reality glasses. For FMCG companies such as Nestlé, working with ARTC on technologies like this enables them to minimise down time and improve performance and capital efficiency in their factories. Many of these advances may sound a bit like science-fiction, but all of the necessary technologies are in development at ARTC. 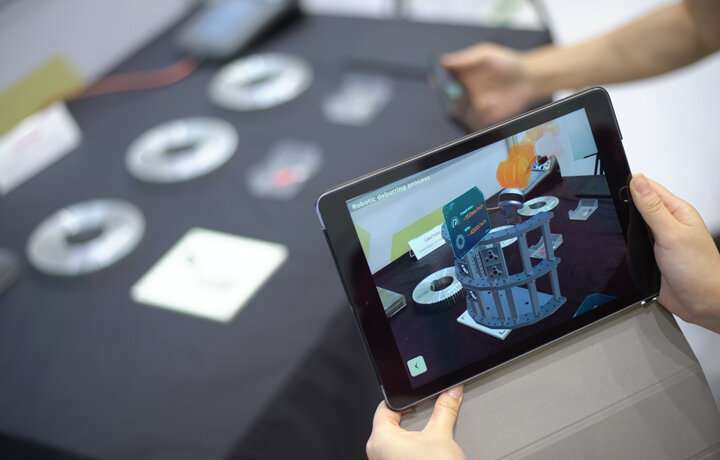 For example, ARTC is building augmented reality capabilities using Microsoft's HoloLens, a type of goggle that mixes visuals of the real world with digitally enhanced overlays. Alongside this, ARTC researchers are building a suite of web-based applications that will give roving workers access to dashboards of important data on their phones and tablets, as well as the means to dial into virtual help if needed. "If some maintenance or repair task is beyond the scope of a worker, [using our tools] a colleague somewhere else could see exactly what the worker standing at the machine sees and guide them on what to do," explains Das. To feed information to these applications, the group is actively investigating how to add sensors to machines from industrial partners. "We have a machine on loan from a company which we have sensorized ourselves," says Das. "We have put in 43 sensors to look at vibration, temperature, and acoustic emissions." ARTC has also developed a digital-twin of a co-bot, a robot designed to physically assist a human operator with tasks such as moving hot or heavy objects. At the moment, information flows only from the physical co-bot to its digital copy, but Wong says that ARTC's digital twins will eventually be bi-directional, so the digital version can adjust the operation of its physical twin in real time, instantly reacting to the information it receives. 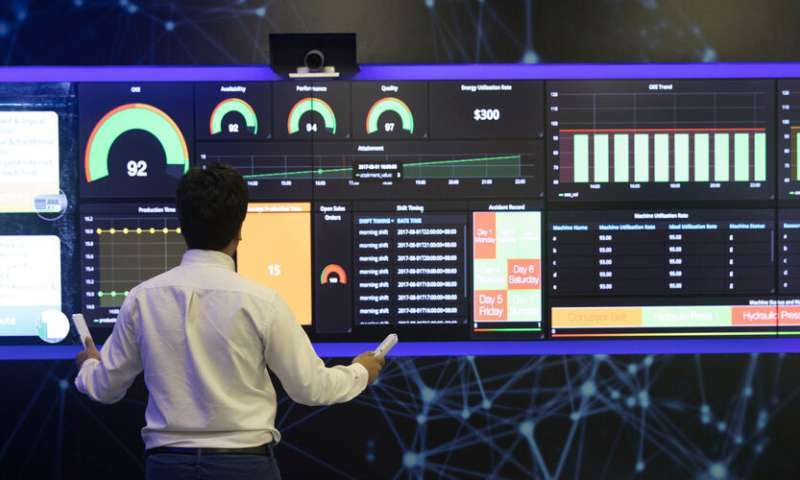 There are security implications of data flowing from smart control rooms directly controlling millions of dollars of expensive, high-precision equipment that ARTC is addressing. "The security of the data is the one thing that everyone is concerned about," says Das. In addition to the security questions raised by having a centralized control room are generalized concerns around having infinitely more data. But this data can be very useful in tracing old faults. For example, when companies hear from their customers that their products have quality problems. Typically, by the time a customer delivers feedback like this, it can be difficult to diagnose what might have caused the problem. So, Das explains, the ARTC digital twin model factory wants to keep all relevant data. "We can go back to a particular day, look at all the dashboards, drill down, diagnose and solve the problem." But in conceiving these systems, Wong says that it's vitally important to focus on designing software architecture that is very secure, as well as scalable, reliable, and lag-free. In the short-term, smart factory developments at ARTC will focus on helping existing factory staff. "The goal is to assist humans by aggregating and digesting data, then creating insights from it," says Wong. "The control room will provide information and predictions, but the human has to make the decision." Eventually, though, Wong expects artificial intelligence (AI) to take on a greater share of the decision-making burden. "As the systems become more intelligent, we can move to full automation by AI. That can relieve humans to focus on things that AI can't do: relationships, supply chain or customer issues, and managing workers." And data will flow not just inside individual smart factories, Das says, but also between them. "Machines will be able to talk to machines directly," she explains, and that includes machines located outside the factory. Networked machines will work together to predict failures, and to respond to them. For example, "the machine in my factory could tell a machine in an offsite factory 'shut down, I don't want the part you're making'," Das says. Unfortunately, corporations are sometimes reluctant to test the technology on their own because they didn't want to disrupt their own facilities. It's also just difficult, says Wong, to bring together experts in manufacturing with the wide range of analytical scientists that could provide useful input. That's why Wong, Das and their colleagues want to provide the means for companies to do proof of concept testing, so that they can make the case to extend their Industry 4.0 investments to their boards and shareholders. "There is so much potential," Wong explains of the motivation for the project. "But there was no showcase or test data that proved that this new technology can really be used to optimize smart factories." The model factory sandbox built by ARTC provides industry with the freedom to experiment and build, then to take back new technologies and best practices to their factory lines. In addition to FMCG companies like Nestlé, these collaborations have already attracted significant interest from aerospace and heavy industry corporations, among others. "We are bridging the gap between pure research and product development," Das explains. As of today, 69 industries have joined ARTC in doing just that. In January, a World Economic Forum analysis of 100 countries placed Singapore at the forefront of this changing landscape, listing it among the 25 countries best positioned to benefit from Industry 4.0. In their discussion, its authors pointed to Singapore's strong competencies in research and development, economic complexity, and openness to trade as major factors. Media analyses have noted a push by the Singapore government to bolster this enviable position, noting a carrot and stick approach with grants and levies being bestowed on manufacturers, and strong financial backing for a series of support systems that including A*STAR's two model factories initiatives. Singapore has also recently launched of the Singapore Smart Industry Readiness Index, a tool to help industrial companies measure their progress towards Industry 4.0 standards. A*STAR's Model Factory Initiative aims to bridge technological gaps so businesses can reinvent themselves through technology co-innovation and adoption. There are two locations – one in A*STAR's Advanced Remanufacturing and Technology Centre (ARTC) and the other in A*STAR's Singapore Institute of Manufacturing Technology (SIMTech). The two play complementary roles to demonstrate the efficacy of advanced manufacturing technologies and guide companies on different legs of their technology adoption journey.